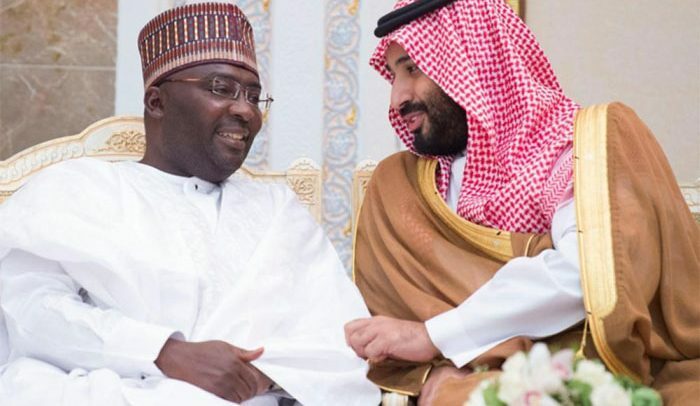 The Saudi King Salman Bin Abdul Aziz Al Saud last Wednesday hosted Vice-President Dr. Mahamudu Bawumia at the end of this year’s Hajj. Being a participant of this year’s Hajj, the vice-president was a special guest of the king. The two discussed important issues bordering on cooperation between their individual countries in a manner which would be mutually beneficent. Crown Prince Mohammed Bin Salman was in attendance during the discussions. Dr. Mahamudu Bawumia is reported to have used the rare opportunity to tell his host about the many development projects ongoing in the country; he invited investors in the oil-rich country to come and invest in Ghana. The king was amused with the vice-president’s narratives about Ghana and showed interest in considering his guest’s proposals. The Saudis have affinity for Muslim foreign dignitaries and are said to have invested in many a country with a large population practising the Islamic faith. Ghana and Saudi Arabia established diplomatic relations shortly after independence and the latter has rendered support in varied areas such as health and agriculture. Saudi Arabia has offered many scholarships to Ghanaians, and many have completed their courses and returned in various fields of study including medicine and engineering. Currently, a Ghanaian, Abdul Jalal, works with the Islamic Development Bank from where he continues to show interest in directing investment opportunities to Ghana. With the vice-president now offered such rare link to the Saudi King, it is envisaged that more investment opportunities would come the way of Ghana. The petro-chemical industry is one area in which the comparative advantage the Saudis have can be supportive of our infant oil and gas investments. Dr. Bawumia’s pilgrimage to Saudi Arabia and the side attraction of meeting the king is being followed with interest by his Muslim compatriots who appreciate the many opportunities such a link with the royal family can bring to Ghana. The vice-president is expected back home on 27th August, 2018, with his wife, Hajia Samira Bawumia.